Good nutrition and eating habits start at an early age. A healthy diet is essential to provide your child with the nutrients she needs for proper growth and development. As a parent, trying to get your child to eat healthy foods can be stressful. You can help your children by understanding healthy meal and snack options and by setting a good example. The challenge is to make healthy foods appealing while ensuring your child’s diet is nutritious and wholesome. Children are constantly growing and using energy. Between school, family activities, after school functions, sporting events, homework and other daily activities, children are busy. They need energy to keep them going; being hungry is natural. Snacking is a good way to satisfy their hunger and provide them with essential nutrients their bodies need. 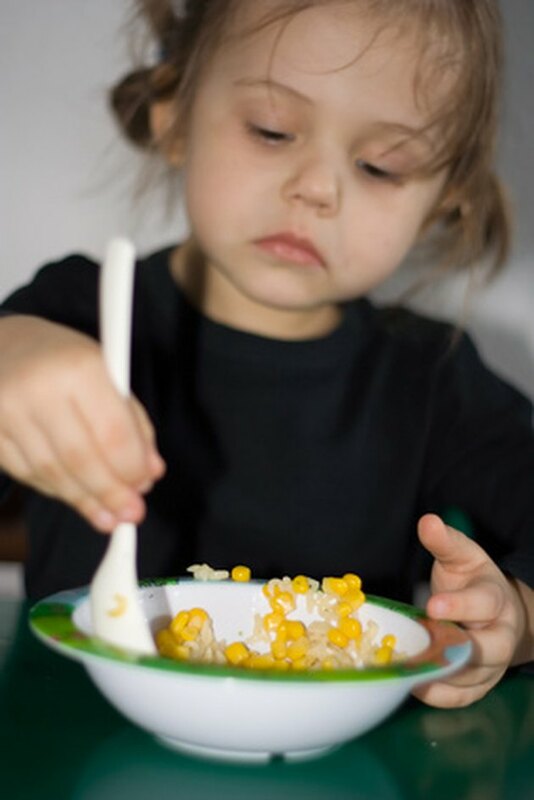 You should provide your child with food that satisfies his hunger and boosts his energy level. Moderation is essential to healthy snacking. The key to healthy snacking is keeping your refrigerator and pantry stocked. For example, low-fat milk, yogurt, chicken, lean meat, hummus, eggs and cheese are high-protein, calcium-rich snacks to keep in your refrigerator. Whole-wheat crackers, pitas, trail mix, nuts and granola are vitamin-rich foods to have on hand in your cupboards. Packed with phytochemicals, vitamins, minerals and antioxidants, fruit and vegetables are healthy snack selections. Combining foods from different food groups make nutritious and delicious snacks. Try whole-grain pitas with hummus, apple slices and cheese, cottage cheese topped with fruit, celery and peanut butter, homemade trail mix, yogurt with granola or fruit smoothies. The key to a happy, healthy dinner is having regular meal times and not being a short-order cook. Dinner time is a family time; everyone should eat the same thing at the same time. You do not need to cook something different for each of your children. Children are often hungry before dinner is ready. Set out carrot sticks, cucumber slices or celery for them to munch on. It is important to involve your children in food preparation, make them a part of the meal and let them choose which foods they want to try. Dinner time does not have to be a battleground. At meals, it is a good idea to give your children milk as it is high in calcium, vitamin D and protein. Aside from lean meat, poultry, fish, beans and legumes, which are high in protein, children typically like chili, soups or stews which blend different ingredients. These foods are excellent sources of protein and vegetables. Children also like tacos, wraps, or other foods which allow them to make their own dinner. Serving a variety of healthy foods with meals will increase your child’s overall nutrient intake. Healthy options include salads, fruit, whole grains, legumes, brown rice, whole-wheat pasta and cooked vegetables. The best way for you to encourage health eating is to eat well yourself. Your child’s impulse to imitate is strong. You need to be a role model to help shape your child’s health and nutrition habits. When your child asks to taste what you are eating, your plate should be filled with healthy selections. You should eat what you want your child to eat because your actions override your good intentions. Serving appropriate portions, not overeating and having a positive attitude toward food will help your child understand the importance of good nutrition. How Many Calories Should a 15 Month Child Consume?